While the presidential campaigns of John McCain and Barack Obama have stepped gingerly around the financial crisis and the question of government intervention, third party candidates Bob Barr and Ralph Nader have shown no such compunction. Instead they have embraced the market meltdown, viewing it as a rare opportunity to highlight bold economic positions and, perhaps as important, claim credit for sounding the early warning alarms. Barr boasts that he was a few weeks ahead of the curve, pointing to an Aug. 15 press release warning that the bailouts of Fannie Mae, Freddie Mac and Bear Stearns would lead to more irresponsible behavior and more bailouts. “The mere possibility of a bailout will discourage companies and markets from adjusting in the future,” said the release. The Nader campaign asserts that the independent candidate’s prescience in predicting the current meltdown dates back more than a decade. Nader, a longtime consumer advocate who ran for president in 2000 and 2004, also predicted that Fannie Mae and Freddie Mac were headed for a crisis in his 2000 campaign. He has seized the opportunity this week to take credit for being ahead of the curve and also to contrast his proposals with those of McCain and Obama. Nader has issued a detailed 10-point plan with short- and long-term proposals ranging from imposing additional conditions on bailout recipients to making the Federal Reserve a Cabinet position that is accountable to Congress. In an interview with Politico last week, Nader emphasized many of the same issues, calling the Federal Reserve “a government within government” that is unaccountable to the public or to democratic institutions. He also said that the current round of bailouts was worse than the Chrysler Corp. rescue of 1979 because it does not impose sufficient conditions on the companies or benefits to the government. Like Nader, Barr also diverges from the cautious positions expressed by McCain and Obama. There is no hedging whatsoever: He opposes any bailout or additional regulation. “Barr supports letting the free market run its course,” said Cory. Cory says that the campaign is seeing increased attention in Barr as a result. “We’re getting more people signing up for the e-mail list, donations are up, our press releases are being carried more widely,” said Cory. And although major media appearances remain somewhat elusive, there has been a notable uptick. The Nader campaign reports that it hasn’t been as fortunate. The Nader experience stands in stark contrast to the surge in media interest in long-shot former Republican presidential contender Ron Paul, who ran in the GOP primary on a platform that strongly opposed deficit spending, called for abolishing the Federal Reserve, and issued dire predictions about the future of the U.S. economy. Though he is no longer running for president, the crisis has sparked an unaccustomed media boomlet for Paul, who has made recent television appearances on CNN, MSNBC, Fox News and Fox Business. Paul, like Nader, asserts that recent events prove the correctness of his economic philosophy. “He thinks this is a long-term crisis that has been unwinding since 1971,” said Jesse Benton, a Paul spokesman. Paul shares Barr’s and Nader’s view that the government’s response has been inappropriate. Bob Barr was caught on record trying to dump the Democratic & Republican candidates off of the ballot. If we had an award for Enormous-Balls-of-Iron it would go to Barr for taking on the Texas party system. Nevertheless, I was out of school on that day and I thought it worthy to recap some of the more interesting local headlines. WASHINGTON — Libertarian presidential nominee Bob Barr’s campaign filed suit Tuesday seeking to remove Republican John McCain and Democrat Barack Obama from the ballot in Texas, alleging that the two major candidates missed the deadline for officially filing to be on the ballot. The lawsuit by the former Republican congressman from Georgia claims that neither McCain nor Obama met the requirement of Texas law that all candidates provide “written certification” of their nomination “before 5 p.m. on the 70th day before election day,” because neither had been formally nominated by their respective parties in time. In Austin on Thursday, Barr accompanied his attorney to request an emergency order from the Texas Supreme Court to stop the state from mailing absentee and military ballots, which is expected to start Saturday. (Barr’s attorney, Drew Shirley, is also the Libertarian nominee for a Texas Supreme Court seat.) The court denied that request by the end of the day. As debates heat up for the final Presidential selection, the most controversial issue of Real IDs keeps bobbing up from the mire. The heated struggle between citizens, state’s rights against federal mandates and the protection of the U.S. identity continues to be an issue. 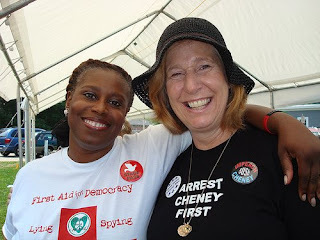 Many of you may have read BTC’s previous President Select post featuring Cynthia McKinney. During this crucial time for voters, the only rule is to vote the issues and to find the candidate that will support your views on the issues. 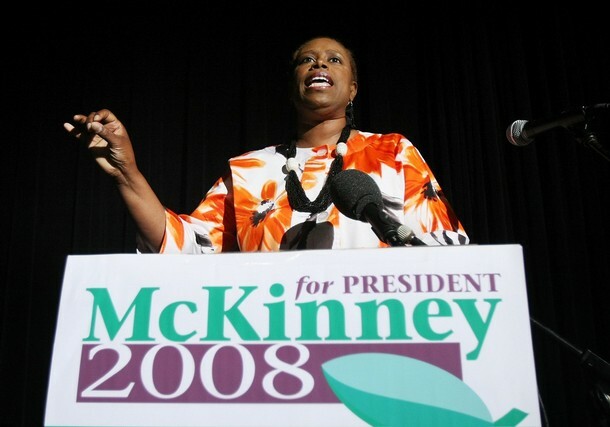 We asked Cynthia McKinney some important questions that are being pushed aside by John McCain and Barak Obama. BTC: Civil liberties violations are a huge complaint with voters. What is your plan to restore Constitutional balances damaged by legislation like The Patriot Act and The Real ID Act? Cynthia McKinney : If elected to office I would take immediate steps to repeal The Real ID Act, the Patriot Act, the Secret Evidence Act, the Military Commissions Act, and all other pieces of legislation that are an affront to our bill of rights. In addition, I would use my executive power to void a great many of the ‘signing statements’ and authoritarian Executive Orders that have concentrated far too much power in the hands of the president. It is imperative to return POWER TO THE PEOPLE, which is my campaign theme. I would make public these power grabs and explain why a real democracy is incompatible with a ‘unitary executive,’ the Bush/Cheney philosophy. BTC: Do you have a plan to address DHS’s role in The Real ID Act a power acting independently of the vote of the people? Such case would be the waiver of 36 federal laws based on Section 102 C of the Real ID Act to expedite the construction of the Border Wall fence. The Supreme Court refused to hear the case from The Sierra Club and Defenders of Wildlife. Cynthia McKinney: The border fence is a wasteful militarized approach to the issue of immigration. It’s not the immigrants who are ‘illegal’; what is illegal is the way U.S. economic policies treat workers in this country and throughout the world. Thousands who have been funneled into hostile terrain by the fence have perished in the past decade. I agree with the groups who initiated the lawsuit that Congress should not have delegated the power to waive federal, state and local laws regarding the construction of the fence to the Department of Homeland Security. I would promote international economic policies that would seek to rapidly build up the economies of neighbor nations to our south so that people can voluntarily return home to their families with viable employment and adequate and affordable food production. Then we would see a large migration southward as people rejoin their families from Mexico to Panama. To replace those departing workers, U.S. businesses must significantly raise wages and vastly improve working conditions, especially with regard to health and safety, so that currently unemployed American workers can and will do this needed work. BTC: How would you address Real Id’s role in the plan for Continuity ofGovernment? Cynthia McKinney : The Real ID is a step toward implementation of a national ID that can then be expanded during a national emergency. We’ve already seen the violations of civil rights that occur after a disaster. After 9/11, over a thousand people, primarily from Middle Eastern, South Asian, and North African countries, were arrested and detained under harsh conditions without charges and denied access to legal counsel. During Hurricane Katrina, police fired their guns over the heads of hurricane survivors attempting to cross a bridge to safety in Gretna, Louisiana. By facilitating the establishment of a federal database of personal information with tremendous potential for misuse, the Real ID will further erode our civil liberties. The real ID is the precursor to a police state of the kind described in Orwell’s 1984 and of the nature of state power exercised in Nazi Germany and the U.S.S.R. It is antithetical to democracy and must be vigorously opposed. BTC: Do you have anything to add about hitchiking legislation to require citizens possess a Real ID to vote or to accept an employment contract? Cynthia McKinney : I pledge to fight against such legislation. As a member of Congress I supported legislation to promote voting access and election integrity. I have fought to defend and reauthorize the Voting Rights Act, I have advocated for same-day voter registration, and I have voted in opposition to requiring photo ID for voting in federal elections. BTC: How would you address the mandate that taxpayers are obligated to finance Real IDs- how would the McKinney Administration manage the fiscal burdens passed to the states to fulfill the Real ID Act? Cynthia McKinney: I would take immediate steps to repeal the Real ID Act once elected. For more information about voting for the McKinney/Clemente please visit : http://votetruth08.com/ . Cynthia McKinney and Cindy Sheehan along with our preferred Deadline Live! radio maven Jack Blood will be featured speakers at the We The People Festival in Los Angeles. BALLOT ACCESS NEWS- This year, the West Virginia Secretary of State ruled that Cynthia McKinney must pay a $2,500 filing fee to be on the general election ballot, even though the Secretary of State is not telling Barack Obama or John McCain that they must pay any fee to be on the November ballot. All three candidates are similarly situated. They are all the presidential nominees of a qualified party in West Virginia. The Mountain Party, which nominated McKinney in West Virginia, is the Green Party affiliate in that state. It has been ballot-qualified since 2000. The Secretary of State’s rationale is that Barack Obama and John McCain already paid a $2,500 fee to be on the state’s presidential primary ballot (the Mountain Party did not hold a presidential primary) and therefore her ruling is just. However, the presidential primary ballot fee is totally independent of a fee for the general election ballot. This conclusion is buttressed by the fact that in 1976, the Secretary of State did not charge Jimmy Carter the then-fee of $2,000 to be on the November 1976 ballot. Carter did not run in the West Virginia presidential primary, so he never paid any filing fee at all. The only candidates in the Democratic West Virginia primary were Senator Robert Byrd and George Wallace. All the other Democratic presidential contenders stayed out of the West Virginia primary so as not to split the anti-Wallace vote. Also the West Virginia Secretary of State did not charge a filing fee to Richard Nixon or George McGovern in 1972. Neither of them had run in a West Virginia presidential primary either, so neither of them paid any fee at all, all year long. UPDATE: Addressing Bob Barr’s offer for Paul to be his running mate. “Paul has not responded to the request, Davis said. Ike Hall, who coordinated Paul’s campaign in Georgia, called Barr’s invitation “terribly interesting,” but added that Paul made clear he has no intention of running as anything other than a Republican this year. All four candidates — Barr, McKinney, Baldwin and Nader — apparently signed a statement from Paul pledging their support for limited government, personal liberties, bringing U.S. troops stationed abroad home, and for an investigation into the Federal Reserve. While Paul ran a distant fourth in the Georgia presidential primary, carrying 2.9 percent of the vote, he has a devoted following and his endorsement has been sought by Barr and by Republican nominee John McCain. Barr sent Paul a letter Tuesday asking him to be his vice presidential nominee. Barr already has a running mate, Wayne Root of Las Vegas. Root said in the letter he would step aside for Paul. Paul has not responded to the request, Davis said. Ike Hall, who coordinated Paul’s campaign in Georgia, called Barr’s invitation “terribly interesting,” but added that Paul made clear he has no intention of running as anything other than a Republican this year. Is Bob Barr Texas’ Only Official Presidential Ballot? According to the Secretary of State, you have the choice to vote for Libertarian Bob Barr, an Anti-Real ID candidate and other write in candidates such as, Green Party nominee Cynthia McKinney. Presidential Candidates steeping in their own hype at the DNC and upcoming RNC appeared to miss the Texas filing deadline yesterday, August 26th. Well, maybe the other Presidential candidates didn’t really miss the deadline. Maybe they are just faking. According to an unnamed afterhours source, both Republican and Democratic parties have what is called a “placeholder ballot” until their party officially selects a candidate at their national convention. If Barack Obama, presumptive nominee for the Democratic party, accepts the party’s nomination this week at the Democratic National Convention in Denver, CO, the Texas Secretary of state will remove the dummy ballot and replace it with Barack Obama. Republicans will officiate their presumptive nominee John McCain at the Republican National Convention in St. Paul, MN next week and then remove their Texas dummy afterward. The Barr campaign complained of longtime inequities and special rules for the top 2 parties. Here is Barr describing another chilling example of democracy gone south. Many political reformers in todays election climate are reaching for issues they believe will philosophically ally themselves with the people. For the time being, party politicians adding a 5-11, or an Anti-Real ID issue, to their stump platform are among the Green Party, Ron Paul Republicans and The Libertarian Party. Each has a unique approach to representing the public on this issue. In Texas, the Green Party voted on Saturday, June 14th to add a 5-11 “stump” to represent any Texan wanting to take a stand against Real ID’s while voting for their party. It didn’t make it to the official stage for a vote, but it was handed off for approval in an amendment platform for latecomers. While Ron Paul’s Presidential Campaign ended, a chasm as large as the Grand Canyon is felt between Paul’s supporters and McCain’s kind of Republicans. Many Ron Paul Republicans (some actually registered Libertarians) are at odds with many of the positions of Libertarian Party Presidential Nominee, Bob Barr. Here’s an exerpt from THIRD PARTY WATCH’s website in the crucial juxtaposition of Dr.Paul and Bob Barr on Real ID. BOB BARR: “Big Government advocates are personified by the current Bush administration, favoring central control of virtually every facet of activity in our society, from education to transportation and from the plumbing in our bathrooms to the bulbs in our lamps. While the Real ID debate shares some elements with its sister debate concerning voter ID, mixing the two as if the two sides of the same coin dilutes the host of fundamental concerns and responsibilities affected by the Real ID Act program now being forced down the throats of the states. BTC Commentary: Ron Paul clearly dictates a descriptive plan of action – the other clearly gives an editorial of what the state of affairs is with no concrete position or plan of action. This leaves Ron Paul Republicans and Libertarians in a valley of indecision, now that Paul’s campaign has ended. BeatTheChip contacted Bob Barr’s campaign about such a plan of action, due to the known uproar amid party members caused by Barr’s nomination as the Libertarian general election Presidential candidate. While local chairs were apologetic, offering a concrete point plan of representation on Real ID, Barr’s campaign offered a publicist with more of the same Op-Ed approach to action. She has not gotten back to us yet. If that is any interpretation of what is ahead, Bob Barr will expound on the Libertarian complaint responding with press engagement, lack of action and even less supportive voting records. In essence, unless we report otherwise, Bob Barr has no real plan to deal with Real ID’s – stopping them or to “Barr” spending with States. Please keep checking back for position reports from other party politicians willing to make government move against Real IDs.